The buildings that will become the operational nerve centre for the Aberdeen Western Peripheral Route project have started arriving on site. 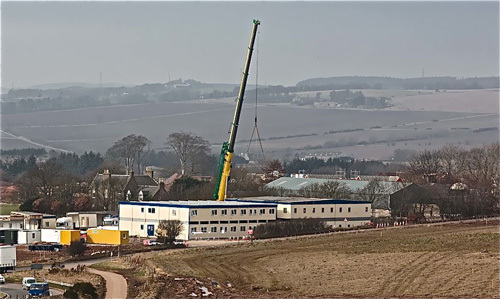 Aberdeen cabin supplier Greenwell Equipment has started delivering and assembling the 60 large modular office blocks that will become the project’s head office. The complex will accommodate office staff from construction consortium Aberdeen Roads Ltd, Transport Scotland and the managing agent. Buildings are being assembled on two levels and are being fully refurbished to provide accommodation for 200 staff. Greenwell also has the contract for a headquarters building for Balfour Beatty to house personnel during the realignment of the A96 at Inveramsay Bridge north of Inverurie. It also supplies modular buildings to the Queensferry Crossing scheme.